Fits all models from late 1984 to 1999. New one piece design bolts directly to lower leg, eliminating the need for a bracket. Kit requires 5/8" bore master cylinder for single disc and 3/4" bore for dual disc. Will not fit Narrowglide 21" wire wheel. 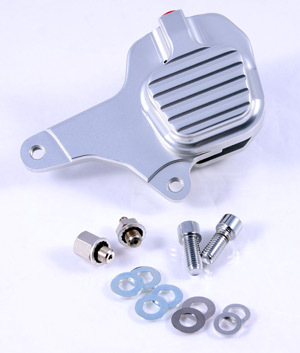 This kit is designed to accept 10mm (3/8-24) banjo bolt.